This Kung Pao shrimp is spicy, but not overly so, and it is delicious with rice. It's easy to make, light (low calorie), and ready in 15 minutes. The Sichuan peppercorn powder in the dish adds such an interesting depth. It's not spicy hot, but gives sort of a tingly sensation to your mouth. It's native to the Sichuan province and not related to chili peppers, which are native to the Americas. What are some hints for successful stir-frying at home? The most important thing to me is mise en place. In other words, do not attempt to multi-task. Do not work on one ingredient while another ingredient is cooking. Get everything ready and lined up because you will be working quickly. Use a digital timer for each step. Until you are an expert, it's really helpful and takes away the guess work. If the recipe you are following has everything in paragraph form, rewrite it in individual steps for yourself with the times next to the steps. If you are like me, use large print. Clean up everything else before stir frying, leaving only your mise en place. While not necessary, you will enjoy your dinner much more knowing you have less clean up after dinner. What brands do you recommend for this recipe? For the oyster sauce, I like Lee Kum Kee, the one with the mother and the boy in a boat on the label. I also like Megachef. For the sesame oil, I prefer the Kadoya brand. For the chili garlic sauce, I like the Huy Fong brand. When I first started learning how to stir-fry (see Wok Wednesdays in my recipe index to learn more about my wok adventures), each new recipe I tried seemed to require a special trip to my local Asian market to hunt down a new ingredient. The first time I tried a new recipe and realized I had all of the Asian condiments in my pantry or refrigerator, I nearly threw a party to celebrate. I now have a refrigerator in my garage that is pretty much dedicated to specialty Asian condiments and specialty flours (for baking bread, my other obsession). At one point, the previous refrigerator died, and I scrambled to save my ingredients as if they were precious gold. Not my proudest moment. What cookbooks do you recommend for stir-frying? If you want to get your Ph.D in stir-frying, check out Grace Young's Stir Frying to the Sky's Edge, and The Breath of a Wok. Make your way through at least one of these books and you will be set. I began with the first one, which is a little more accessible, and the stories with each recipe are worth the price of the book. 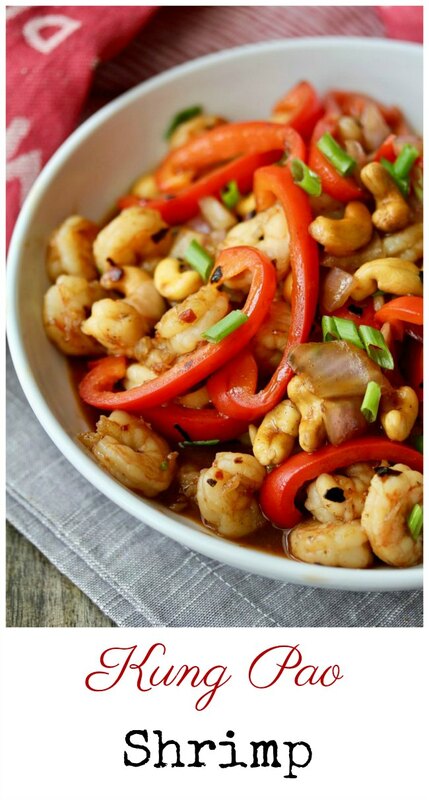 This recipe for Kung Pao Shrimp was adapted from the book 101 Asian Dishes You Need to Cook Before You Die by Jet Tila, which I am loving. There are about 18 wok recipes in the book and I want to try them all. There are also sections on grilling, noodles, soups, sushi, salads, dumplings, and sweets. This recipe calls for 4 to 6 dried chili de arbol. These are intended to impart heat to the dish, but not to be eaten. If you can't find the Sichuan peppercorns, go ahead and make this Kung Pao shrimp anyway. It's still delicious. The recipe calls for 3 pounds of unpeeled shrimp, which you peel and devein. If you happen to find shrimp that is already peeled and deveined, use about 25 to 30 ounces. This month, the Fish Friday Foodies are creating seafood stir-fries! Check them out! Combine the chili garlic sauce, oyster sauce, sesame oil, chicken stock, and cornstarch slurry in a small bowl. Set aside. Heat a wok or large sauté pan over high heat. Swirl in the oil, garlic, chilies and crushed red pepper. Stir for about 30 seconds. Add the shrimp to the pan spread it out into a single layer, and let it cook for 30 seconds. Stir-fry for another 30 to 60 seconds, until the shrimp just starts to turn pink. Add the vegetables and cashews, and stir-fry for about a minute. Add the sauce, Sichuan peppercorn powder, the white pepper, and stir until the sauce thickens and coats the shrimp. Stir-fry for another minute until the shrimp is fully cooked. Add the scallions and stir. What a gorgeous dish. 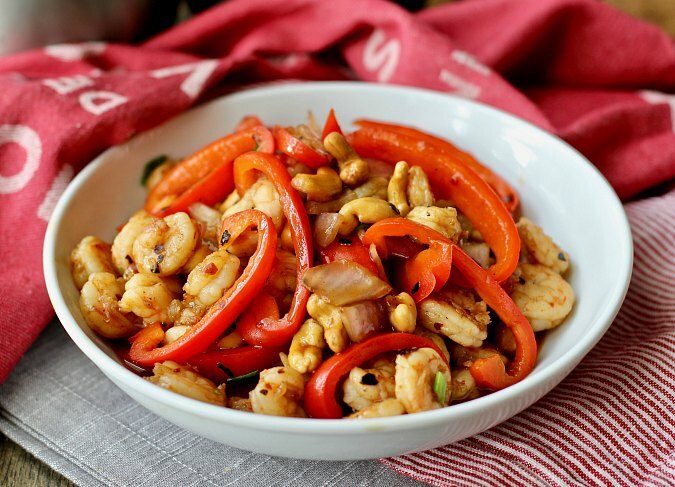 Love Kung Pao shrimp and pleased to have this recipe. 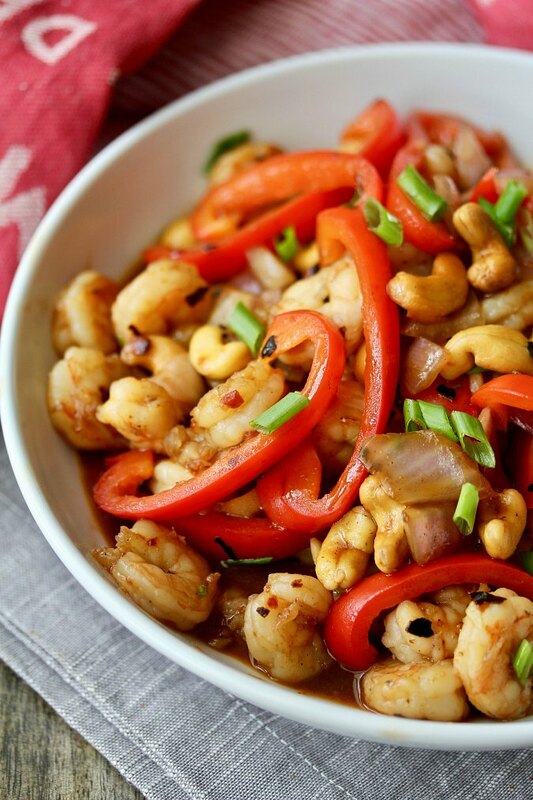 Fantastic combo.. cashews with shrimp. I love the sound of these flavors, sounds delicious! Kung Pao chicken is one of my favorite items to order when we do take out - I'm excited to make your version at home. So much healthier! Thanks Liz. So true. You can aways use peanuts for that "take-out" flavor. I haven't made anything like this in a while. That's going to change real soon! This looks delicious, thanks for sharing!